I raced an Astute once. 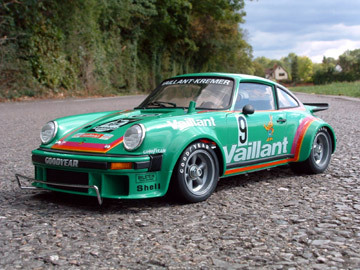 I borrowed one when my Ultima was grounded due to lack of spares for a meeting. 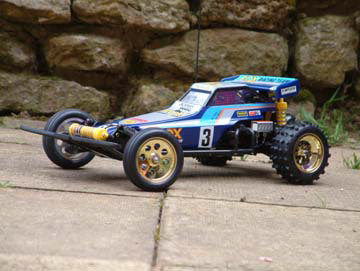 My friend generously suggested I take his Astute out instead as he was racing 4WD. It was an odd beast and no mistake. No matter what I did to it, either whilst driving or setting up, it simply would not do anything but understeer and understeer badly. The Ultima would flick out on demand if you set it up right, and handled more like a 4WD car, but the Astute just wanted to go straight on. If you could turn in early enough and feather the throttle through the corner, it was fine, as it had an extremely low centre of gravity and was as stable as anything. In tight infield sections, it just didn't want to know. The only thing I can think of was the fact I was using a fairly mild motor, because my cells were old and couldn't take anything really potent without dumping. It could be that with a louder wind you could break traction and balance the tail on the throttle through corners. But in my experience, you couldn't slide it, drift it, roll it or do anything with it but serenely and calmly understeer. It was so stable it was almost dull. It's been a while since I saw the gearbox end of one of these, but if it's got the set-up I remember, with the two drive belts next to each other in the drivetrain, then one of the set-up tips at the time was that one of them can be safey removed. I have no idea why they put two in, as all the second one adds is friction. If I'm thinking of the wrong car, and there are no such belts, then ignore me and I apologise. As I said, it's been a while since I saw the business end of one of these. 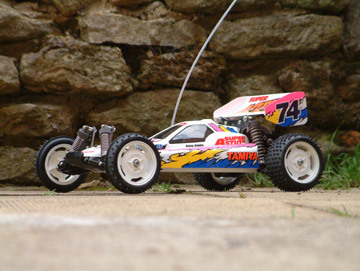 The Astute seemed to be the first attempt by Tamiya to create a true 2wd racer. For this reason it comes with a pretty impressive spec which includes a ball diff, a ball-raced gearbox, oil-filled dampers at each corner, a front anti-roll bar and every aspect of the suspension geometry is adjustable. They also took the unusual step of installing metal bushes in all suspension pivot points which reduces the amount of slop in the suspension due to flexing and slows down the rate of wear in these joints. Of course what it also does is add weight and to the average racer I’m sure the cost of a new set of wishbones each season would be outweighed but a reduced weight and better performance. Although amazingly adjustable this did add extra weight and complexity and it may be for these reasons that it was never very widely used on the racing scene although Jamie Booth did win the world championship in 19?? with a modified and simplified Astute. Some of his mods were later found on the Super Astute which addressed many of the faults of the Astute. Today it’s great to see that the Astute has not been overlooked by collectors. 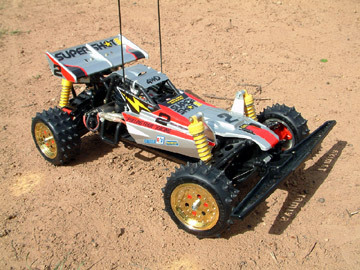 Complete cars or parts can be picked up reasonably cheaply and they are a very tough machine. 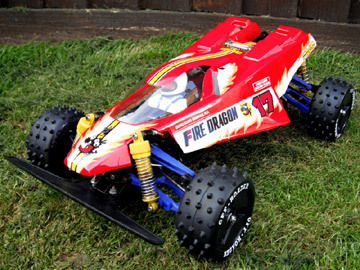 They look fantastic and in my opinion are probably the best looking 2wd modern buggy that Tamiya have ever produced. The Dynastorm may be technically better but the Astute wins hands down on looks.